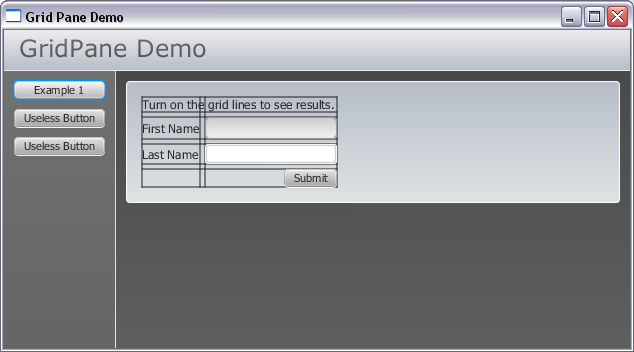 My original objective was to work with the GridPane layout manager. During my learning process I ended up working with the VBox, HBox, BorderPane and GridPane. Below is the code. Please see attached PDFs. I have two versions of each PDF with our without line numbers. Also consider taking a look at several tutorials on other layout managers in JavaFX 2 on javadesk.co website. 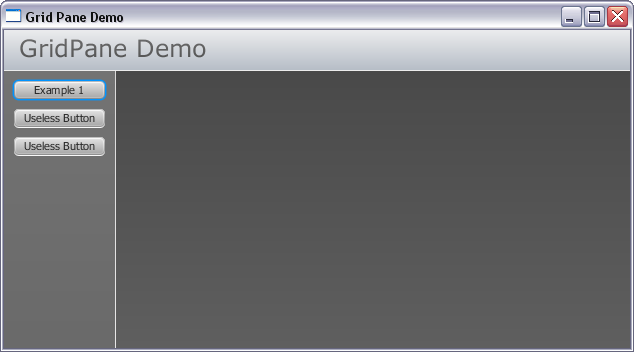 JavaFX 2 application (no line numbers)This version of the source code does not contain line numbers. Use this version for copy / paste. JavaFX 2 CSS style sheet (no line numbers)This version of the CSS style sheet used with application does not contain line numbers. Use this version for copy / paste. JavaFX 2 application (with line numbers)This version of the source code contains line numbers. Use this version for printing. JavaFX 2 CSS style sheet (with line numbers)This version of the CSS style sheet used with application contains line numbers. Use this version for printing. * Demo1. Entry point into demonstration application. layout = new BorderPane();  //This is the "root node". * main. Application Entry Point. * buildLeft. This method builds the Left Region of BorderPane. * This is a BorderPane with VBox containing buttons and border. // Create a faux border-right effect using a Label. //Place all demonstration buttons in a Vercial Box. //Set Alignment of Buttons in VBox Container. //Set All Buttons to the same size. * buildTop. Create a Title Bar. // Create a faux border-bottom effect using a Label. //Create an HBox to hold title. //Add topLayout (a BorderPane Manager) to App Layout. * setSceneProperties. This simply sets app to almost full size. * It also is where the css stylesheet is attached to app. //The percentage values are used as multipliers for screen width/height. //Calculate the width / height of screen. //the dimensions to 98% of screen width & 90% screen height. //Add CSS Style Sheet (located in same package as this class). //Turn on GridLines so we can see what is going on. //Give the GridPane an ID for CSS Styles. //Add some spacing between each control. //not explicitly set. It will remove the padding you specified. //Add a description of what we are doing to GridPane. //2 columns and one row. //span any columns or rows. //does not span any columns or rows. //Add Last Name Text Field in Col 1, Row 2. //Align the Submit Button to Right. 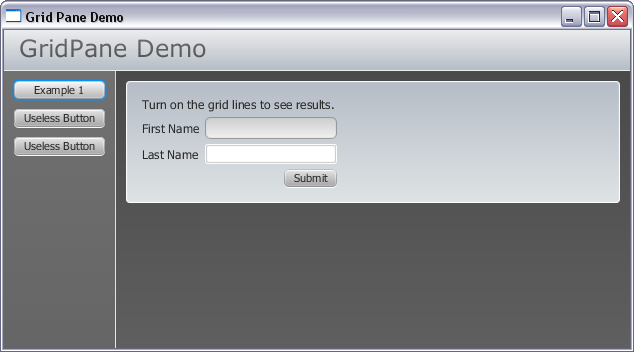 Description: Style our JavaFX 2 application demo. (or directory) as Java class. * into the Scene constructor. * This CSS style is for the buttonBox in Left region of BorderPane. * around the VBox inner edges. * Give the buttonBox container a subtle hover effect. * property to the screen size. This creates the effect of a bottom border. * Set the background color here. * create the bottom border effect (#divider2). * In this css style, we are applying styles to a GridPane. * so content automatically fills available space. 100% width and height. * text field while active. * Apply this style to all Label objects. I’m wondering if you could share the project files (netbeans). That will be really appreciated.